“I wish there were 6 STARS above. 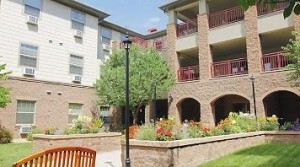 The Granville would be 6!” – Richard & Phil C.
“Love the staff here! It’s real warm and inviting. The staff have a lot of fun and so do the residents.” – Ronda A. “Very friendly and caring staff. Safe environment.” – Kathy S.
“I am an 87 year-old youngster. Why am I posting this note? No plea for romance … no scam for cash … maybe my message will help one who needs assistance in everyday living. Last year I suffered a fall, leaving me needing help in some situations. Now I live alone in an assisted living facility. My needs have been met all because I went looking. After visiting five (assisted livings) I finally found a facility I can call ‘home!’ Are all equal? Hardly! My home, The Granville in Lakewood, Colorado has scheduled programs 7 days weekly … morning off site activities, shopping trips, etc. If you want to stay busy, The Granville will keep you busy. Ah, but you ask, ‘what is the difference?’ ATTITUDE! The team lets you know when you enter the lobby, “you are home.” I am not recommending any facility … I found my home because I looked for it. If this style of living may be in your future, then I say, ‘Hit the bricks.’ “ – Earl B. “There is a little store here and a library, and because I am an avid reader, that makes me so very happy! I have made lots of friends in my 7½ years here and I’m really so very happy here!! It is a GREAT PLACE to live! !” – Helen G.